Enjoy the ride, and stay tuned for lots more. *Special thanks to FPB owner Pete Rossin for narrating the footage. This entry was posted on Wednesday, April 19th, 2017 at 2:16 pm and is filed under Dashew Logs, FPB 78, FPB 78 Videos, The Logs, Videos & Slideshows. Both comments and pings are currently closed. Keep your fingers crossed. We are headed N on Saturday and might get “lucky” with the conditions. 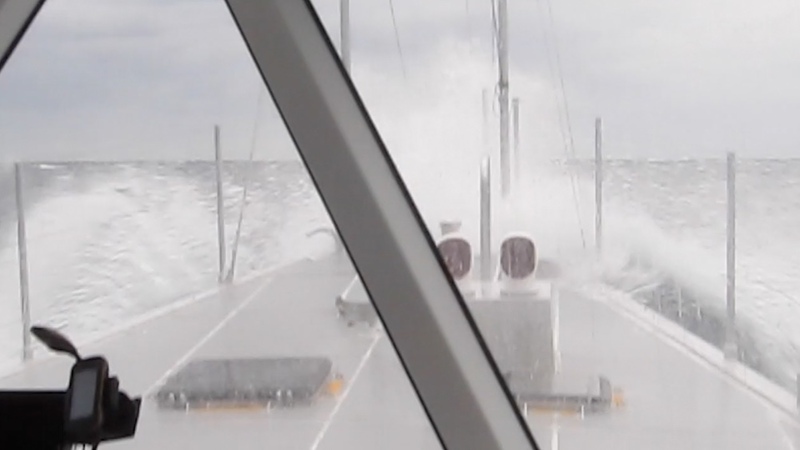 Hi Steve: Impressive ride into the waves. I wonder about the purpose of the lengthened forward mast and the yellow rectangles around the hatches of the fore deck? The taller forard mast is the result of MCA code 0 height requirements for the steaming light.